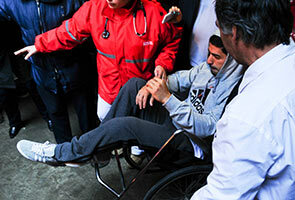 MONTEVIDEO: Uruguayan striker Luis Suarez left a hospital in this capital in a wheelchair after undergoing minor surgery on his left knee, but he appeared in good spirits and promised his countrymen that he would be ready to compete in the World Cup. The star of the Uruguayan national team - and of English club Liverpool, where he scored 31 goals to lead the Premier League - has already returned to his home in Montevideo. Before departing the hospital Thursday, Suarez told his countrymen not to worry because he will be ready for soccer's premier showcase, which starts on June 12. "I'm doing great and I'll be running soon. Thank you to everyone and don't worry because I'll be there," Suarez said in an e-mail message to a Uruguay reporter, who posted the player's response on his Twitter account. Suarez, 27, underwent arthroscopic surgery on his left knee, according to Uruguay's soccer federation, which said it has not ruled Suarez out of the World Cup in Brazil. Uruguay has been drawn in Group D, which also includes Italy, England and Costa Rica. "Suarez might be ready to play in Brazil," said the Uruguay Football Association (AUF) in a statement. Estimates on his recovery range from 15 days to a minimum of four weeks with Uruguay's Group D opener on 14 June. The statement added that "no other damage to the knee was spotted". Uruguay FA president Wilmar Valdez suggested if Suarez's recovery went to plan he could return to training in just over a fortnight. "We know the surgery was a success and that the injury is not serious. We have to wait and see how he recovers," he told Uruguayan newspaper La Ovacion. "These are injuries that, considering Suarez's fitness and if the recovery is good, will not take long for him to return to play." Suarez sounded more positive when he spoke to sports website ovaciondigital.com.uy. "Many thanks to all of you for your support," he said. "Relax, because I'll get there and work hard these days to be 100% to help my team-mates." Suarez finished as this season's English Premier League leading scorer with 31 goals, despite missing the opening five matches through suspension. His goals helped Liverpool rise from a seventh-place finish in 2012-13 to second in 2013-14. He also won the Professional Footballers' Association and Football Writers' Association player of the year awards this season. Suarez finished as top scorer in the South American section of World Cup qualifying, scoring 11 goals as Uruguay finished fifth in the continent's nine-team group before winning a play-off. He is also a proven performer at major tournaments, helping Uruguay to the semi-finals of the 2010 World Cup and scoring four times as his side won the Copa America the following year. His partnership with Paris St-Germain striker Edinson Cavani is a key part of coach Oscar Tabarez's plans.